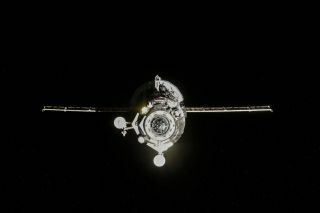 The robotic Progress 55 cargo ship (shown here) left the International Space Station in July 2014. The Progress 59 freighter burned up in Earth's atmosphere on May 7, 2015, nine days after suffering a serious malfunction shortly after launch. Progress spacecraft are automated, unpiloted and single-use vehicles that typically deliver fuel and supplies to the International Space Station three to four times each year. They have been supplying the ISS since 2001. The Progress design was modeled after Russia's Soyuz space capsule, which carries crewmembers to the ISS, but it is specially modified to carry cargo instead of people. Like the Soyuz, Progress vehicles are built to fly themselves but can also be remote-controlled by cosmonauts on the Space Station if required. More recently, two Progress flights (between dozens of successful launches) failed to reach the ISS. Progress M-12M (also known as Progress 44 or 44P) was lost during launch in August 2011. The failure happened due to a malfunction in the Soyuz rocket. In 2015, Progress M-27M (also known as Progress 59 or 59P) spun out of control in low Earth orbit shortly after demating from its rocket, and could not be recovered. The loss was later attributed to a "design peculiarity" between the Soyuz and Progress. Progress also has a propulsion module, similar in design to the instrumentation/propulsion module on the Soyuz. This module contains the electronic equipment, or avionics, for Progress' systems and sensors, allowing automatic docking to the ISS. Progress' thrusters can also be used to boost the space station's orbit to a higher altitude, or change its orientation. Lastly, Progress has a refueling module in place of the Soyuz descent module. Its eight propellant tanks can hold up to 1,740 kilograms (3,836 lbs.) of fluid, depending on how much weight is carried in the cargo module. Four of the tanks contain fuel while the other four contain the fuel's oxidizer. Like the Soyuz, Progress is launched atop the Soyuz rocket from the central Asian spaceport of Baikonur Cosmodrome in Kazakhstan. A disposable spacecraft, it typically burns up over the Pacific Ocean upon re-entry into Earth's atmosphere. ISS crewmembers typically put trash and unneeded items into the Progress before it undocks from the ISS. One of the more famous trash items was the first treadmill on ISS. After being replaced, the original treadmill was sent away on a Progress in 2013 and burned up in Earth's atmosphere.